the 2008 movie "Pineapple Express" was filmed. The light blue line marks the route of the police chase. 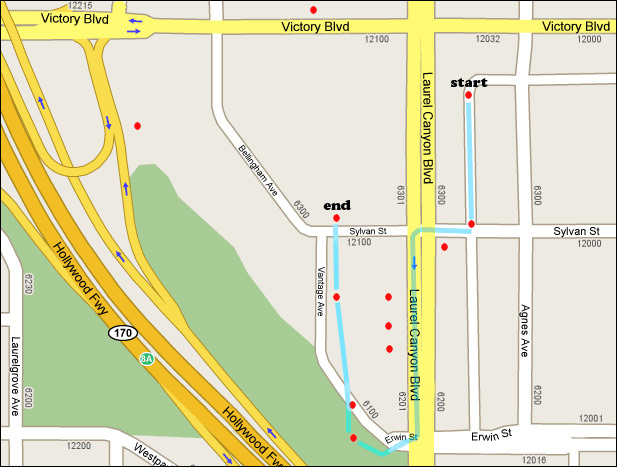 Hover your cursor over the red dots to identify spots along the chase route. Click on the red dots to jump to the matching descriptions & photos below. The long arrest/chase scene starts out with Dale (Seth Rogen) & Saul (James Franco) smoking pot in an alley with some local school boys. * A tip of the hat to Christian Jensen, who alerted me to this rabbit mural location (and other locations in this chase) in Pineapple Express, before I had even seen the movie. Thanks, Chris! The small door seen to the right of the rabbit mural (with a fake "Beer & Wine" store sign over it) is the rear door to 6344 Laurel Canyon Blvd, which, in real life, houses "Ed Simon Chiropractic". After smoking the weed, the kids exit south down the same alleyway. Saul heads out the same way (to get some food), just before the cop car arrives. That patrol car comes heading west down a side alley, then turns south into the main alley and parks there, across from Seth (who is smoking a joint next to the rabbit mural on the west side of the alley). In the photo above, we are looking north, up the alley. The tall glass/mirrored building you see behind them, at the north end of that alley, currently houses CalNational Bank, and its address is 6350 Laurel Canyon Blvd., at the SE corner of Laurel Canyon Blvd & Victory Blvd. The female cop busts Seth, telling him that she just saw the stoned kids leaving the alley. In the photo above, we are looking south down the alley. As she is handcuffing Dale, the cop turns Dale around to face the east. During this handcuff shot, we can see another mural (a more abstract one) behind him. (A close look reveals that it appears to include a psychedelic octopus.) The camera is looking south at this point. That abstract mural is on the north-facing wall in the alley, the rear wall of 6334 Laurel Canyon Blvd. (which, as of early 2009, appears to be, appropriately enough, a head shop called "Dementia"). The policewoman calls in about Dale, to see if he has a record, and when she finds that there's a warrant out on him, she radios in that she has him in custody. Rosie Perez, the crooked cop, is in her own police car when she hears this report come over the radio. When we see her in her car, she is parked in a parking lot of a shopping center called Valley Plaza, near the southwest corner of the former Regal Cinemas building (movie theatres), at 6355 Bellingham Ave. (just south of Victory). As of 2009, the theatre building, like many of the businesses in Valley Plaza shopping center, is empty, sitting behind a chain link fence. They they filmed a good portion of the police chase in that half-empty center. The large billboard we glimpse behind Rosie's cop car (in the photo above) sits atop an office building at 12226 Victory North Hollywood, that currently houses "Extreme Rims". Just then, Saul returns with some food, looks up the alley, and sees Dale getting arrested. The camera is first looking south at Saul, and Saul is walking east on the north side of Sylvan Street, at the south end of the alley. When he sees Seth being arrested, he's looking north up the alley (from Sylvan Street). With Dale locked up in the back of the patrol car, the cop car heads south down the alley, with the policewoman talking to Dale about Rosie Perez, and not really paying attention to where she's driving. When she reaches the south end of the alley (at Sylvan Street) Saul jumps out and tries to stop the car. 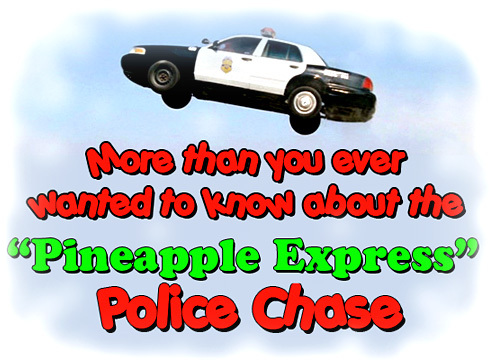 The cop car hits him, spilling his red Slurpies all over the windshield. As the policewoman gets out of the car to see what happened, and walks south around the car's east side, Saul sneaks north long the car's west side, around the rear of the car, then back south along the car's east side to sneak into its driver's seat. Saul then puts the cop car into reverse and backs north up the alleyway, with the policewoman threatening to shoot him. Just then, Rosie Perez arrives in her own cop car, turning (from west to south) into the north end of the alley, and then heads south (in the alley) towards Seth & Saul. The two car's collide in a rear-ender. Saul then puts the car into drive and heads back south down the alleyway. The south end of the alley (at Sylvan Street) is blocked by the first policewoman, who fires several shots at their (her own) car, before jumping out of the way. As he emerges from the south end of the alley, a backing car causes Seth to swerve, knocking over paper racks on the south side of Sylvan (near Re/Max), then he turns right (west) on Sylvan Street. Seth turns left (south) from Sylvan out onto Laurel Canyon Blvd. As he turns, we get a good look at a RE/Max building. That RE/Max is located at 6260 Laurel Canyon Blvd (on the southeast corner of Laurel Canyon & Sylvan). In the photo above, the camera is looking southeast across Laurel Canyon Blvd. At the moment Saul's foot breaks through the windshield, we see they are passing a Sizzler restaurant. That's on the west side of Valley Plaza, at 6343 Laurel Canyon Blvd., on the west side of the street. They then continue that "cheat" - with a shot (above) in which the cars pass that same RE/Max for a second time, while still heading south. While driving south, swerving back & forth over the center divider, with his foot still stuck in the windshield, Saul passes a Gold's Gym. That gym is located at 6233 Laurel Canyon Blvd, on the west side of the Boulevard. After finally pulling his foot out of the windshield, Saul hangs a sharp right past a grassy park with trees. He is actually turning west onto Erwin Street (from the southbound Laurel Canyon Blvd. The building on the right corner, with the green, French-style roof, is at 6205 Laurel Canyon Blvd, and (like many stores in this area) currently appears to be empty (but previously housed a family counseling office). The grassy park on the left acts as a landscaped side buffer agsinst the Hollywood (101) Freeway, sheltering the Valley Plaza shopping center from the freeway's northbound traffic. But iapparently, it's officially the south end a park, named the Valley Plaza Park (12240 Archwood St.), a park that runs for quite a distance north, along the side of the freeway. They continue the chase, with Rosie Perez driving west on Erwin Street, and the guys driving the same direction, only across the park (Valley Plaza Park), weaving through the trees. Saul then hits some kind of incline and his car becomes airborne. In the background, as they sail by (heading north), you can see the back (west) side of "Bellagio Furniture". Bellagio is at 6227 Laurel Canyon Blvd, and is right next door to (south of) the Gold's Gym they just passed on their way south. The road they sailed over is Vantage Avenue (which is really just Erwin Street, renamed here as it curves into the shopping center). The guys find themselves heading back north through the parking lot of the Valley Plaza Center, behind the row of buildings that houses Gold's Gym and Bellagio furniture - WEST of Laurel Canyon Drive, and east of the Hollywood Freeway. Seth tells Saul to do something, so Saul (inexplicably) comes to a sudden stop. When he does, Rosie Perez stops next to them, and uses the opportunity to shoot at them, her bullets shattering their passenger-side window. They actually stop in front of a small, free-standing building in that back parking lot, which housed a drapery cleaning business (at 6240 Vantage Ave) and the Valley Plaza station of the U.S. Postal Service (at 6242 Vantage). Both businesses appear to be currently closed. Saul takes off again. As they speed across the parking lot (heading north), we can see a Sears store in the distance. This Sears store isn't in the same lot - it is actually located across a major street (to the north), at 12121 Victory Blvd. Just then, Rosie Perez swerves to avoid a moving car, loses control of her car, and smashes head-on into the rear of a parked Cadillac, her own car becoming airborne and flipping over,. This scene was staged just a few feet northeast of the intersection of two small "streets" in the parking lot: Vantage Ave and Sylvan Street. Some of the photos on this page are stills from the DVD of "Pineapple Express"
(which you can buy by clicking here) and are copyright Columbia.